On the dark, sub-zero morning of February 20, 2008, eight pilgrims to the Holy Land boarded the Van Galder bus in Madison, WI: Gordon Govier, Keith Schoville, Jim and Jacquie Tanner, Rob and Gloria Jean Ehlers and Jim and Sandy Minor. At Chicago O'Hare airport we were joined by William and Judy Block, Elden Davis and Pat McGuire. After passing through security, we were greeted by a live mouse that scurried through our group and exited through security the wrong way. At Newark airport we were joined by Carol Kissinger, John Miller and Beth Kissinger and our travel agent, Joan Keane. 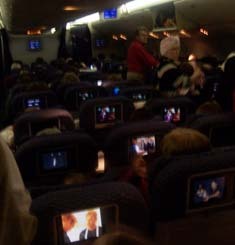 Some of us did not sleep too well on the overseas flight (e.g. someone kept climbing over Keith) but eventually we were served breakfast. I don't usually complain, but this one made me long for the famous Israeli breakfasts I had heard about. I was not to be disappointed. Upon arrival at Ben Gurion Airport in Tel Aviv, we gathered our bags, boarded our tour bus and met our Israeli tour guide for the week, Ellen Rosenberg, and our driver, Salim. It was mid-day in Israel and we set off immediately to visit the Neot Kedumim Biblical Landscape Reserve, just 10 minutes from the airport. Our guide through the reserve was Ronit. 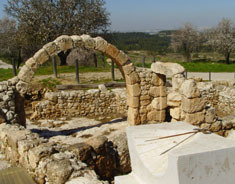 She showed us an ancient sundial found in Jerusalem. With the help of skilled volunteer actors from our group, she demonstrated the drawing of water from an ancient well such as the well where Isaac met Rebekah, and the pressing of grapes into wine. She showed all of us how to make biblical "pizza" which involved grinding together oregano(hyssop), sumac, and salt with stone mortars and pestles. Pita bread was dipped into olive oil and then into the ground spice mix and eaten. It was delicious. We were then taken to the Grand Beach hotel, a block from the Mediterranean Sea in Tel Aviv. There we were met by Doug and Linda Lida who had flown in from Italy and completed our tour group. Some enjoyed a walk along the beach before our buffet dinner. Then we had a preliminary orientation lecture by Dr. Randy Smith and were off to bed in anticipation of our start early the next morning.